TEN HUT! 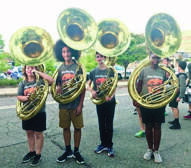 THE FERNDALE HIGH SCHOOL MARCHING BAND IS PREPARING TO TAKE THE FIELD AT FORD FIELD THIS NOVEMBER,participating in the Michigan Competing Band Association (MCBA) State Championship Contest. Many people have seen high school marching bands in action, but few watching the performance know how much hard work and long practice hours that staff and students put in to reach the state-level competition. “Marching Band at the highest level has become music theater on a football field,” says FHS Marching Band Director Elon J. Jamison. “The kids play, march, dance, sing, act, and so on. It is a monumental physical, mental, and emotional activity.” Jamison has been on staff at FHS for 20 years, serving more than a dozen years as FHS Marching Band Director. FHS typically does very well in MCBA statewide events. “Ferndale has brought home top honors nine of the last 13 years,” says FHS assistant band director Audrey Langley. There is quite a process in achieving a slot competing at the state level. Each spring, MCBA member bands are divided into four flights of competition based on school enrollment numbers taken from the second semester school count. The four MCBA competition flight levels range from schools with less than 728 students to greater than 1436 pupils. To advance into the MCBA State Championship con-test, bands pay a $150.00 fee and must compete in at least two of the 20 or more contests that MCBA holds each year. A band must attain scores at MCBA contests placing it among the 12 highest scoring bands in its flight competition. Judging categories are weighted between musical, visual and overall general effect. ASIDE FROM ACHIEVING HIGH SCORES, music education in general and marching band participation particularly carries many benefits for students. INTERESTED COMMUNITY MEMBERS CAN HELP THE ARTS at FHS through the non-profit group FAB (Ferndale Fine Arts Boosters) which supports the march-ing band and other programs. “Marching band is a large subcommittee of FAB run by a handful of dedicated parents,” Langley said. “Without them, we would not be able to function at the level we do. They are wizards of finance. “FAB meets the second Tuesday of every month in the Ferndale High School Media Center at 7:00 P.M. You need not have a student in the schools to be a member; all interested adults who wish to support FAB are welcome. A $5 donation or more helps continue the Fine Arts Program at FHS. Donations are tax deductible.